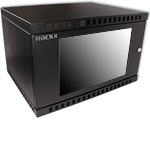 Rackit® Technology Corporation today introduced Wallit SH, a new, shallow-depth yet feature-rich wall-mount communications enclosure. Designed specifically for easy installation on the wall by one person, Wallit™ SH ships with a hanging bracket that runs the width of the cabinet, featuring multiple holes to facilitate stud and non-stud wall-mounting. Once the hanging bracket is mounted to the wall, Wallit SH hangs on it, making it easy to complete the wall-mounting through four available key-holes. Four (4) available positions in the front of the cabinet make the #10-32 pre-tapped mounting rails depth-adjustable in 1-inch increments for a maximum usable depth of 16¾ inches. Complete with ample cable access, extensive passive ventilation and the option to mount one or two exhaust fans for better cooling, Wallit SH enclosures provide 19" rack-mounting capability for small to medium deployments (6U, 9U and 12U), rated at 150 lbs. weight-load. Contact your Rackit sales representative for further information or sales support, and ask about Rackit's life-time warranty on Rackit's racks and rack-accessories.